The single common cause of problems in control valves is flow disruption. Mark Lobo was always fighting that during a 20 year career engineering hundreds of valve designs. He also observed the vast difference between control valve engineering and that of the company’s companion product: venturi tubes. Why couldn’t a flow path be developed that would be “least disruptive”, thus minimizing the effect of chaotic fluid flow? When pressure drop is greater than half of the upstream pressure, the service is “severe”, and the precision valves Mark was responsible for will take a beating. Wouldn’t it be great if a Z-pattern globe control valve could be replaced with a straight-pattern valve with the trim axis aligned with the pipe line . . .
Mark’s five years in the oil and gas wellhead “choke” world only drove the point home: flow disruptions kill control valves. The term comes from the early days of the oil patch, when the high well pressure had to be held back or “choked” to reduce pressure downstream to a tank or pipeline. Originally an elbow type fitting with a replaceable orifice, chokes became adjustable so that as well pressures changed the restriction could be changed. The multiple-orifice disk valve, or MOV, answered the call by employing two tungsten carbide discs that could be rotated against each other to partially obscure the orifices. Robust design and erosion resistant materials in the flow path allow these valves to endure the off-axis jets of fluid flowing through unaligned holes. Wouldn’t it be great if the high-velocity streams could be kept away from the flow path surfaces . . . Between the worlds of precision industrial control valves and those in the oil patch is the realm of severe service. Precision control, robust design and the ability to endure high pressure drop and erosive fluids makes huge demands on control valve engineering. Mark had had enough of making sure valves could handle disrupted fluid flow. Five more years and he had combined the concepts of venturi tubes, globe control valves and internal actuation systems to develop a truly innovative valve design. The valve trim axis is aligned with the pipeline and the trim components move along that line as they are rotated by a bevel gear with teeth arranged on a helix of the same pitch as the threads that resist linear force. Working with the advisors at i2E (www.i2e.org), a business plan was developed to build five valves for field test. Mark has coached through the process of explaining the product concept to potential investors, acquired funding, and launched VSI in March of 2015. 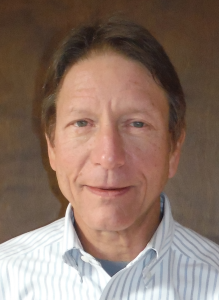 Mark has a BSME from Oklahoma State University and has been a licensed professional engineer in Oklahoma for over 30 years. He has held positions of engineering responsibility for product designs as varied as military aircraft and electronics, commercial food service equipment, well logging equipment and control valves. He is currently heads Lobo Engineering PLC and is Managing Director of VSI.